July 2 Took position here 3.30 p.m. and became actively engaged. At 5 p.m. advanced to Peach Orchard and continued firing until dark. Returned here after night. July 3 The Napoleons remained here. The two rifles with the two rifles of Fraser's Battery took position at 5 a.m. under Capt. Manly on crest beyond Emmitsburg Road and North of Peach Orchard were engaged in the great cannonade and after Longstreet's assault aided in checking pursuit. Continued firing at intervals until 7.30 p.m. Then resumed this position. July 4 At 10 a.m. aided in checking an advance of three regiments. After night withdrew from the field. Losses killed 3, wounded 4, missing 4. Horses killed or disabled 20. 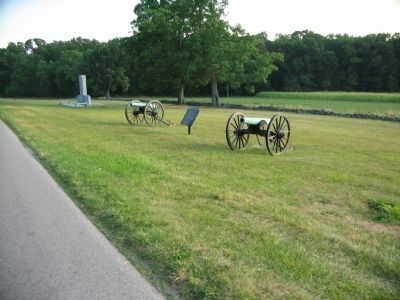 Two 12-pounder Confederate Napoleons flank the tablet. The South Carolina Memorial stands just south of the tablet location. 15.354′ W. Marker is near Gettysburg, Pennsylvania, in Adams County. Marker is on West Confederate Avenue, on the right when traveling south. Touch for map. 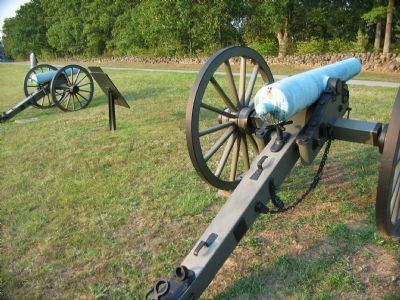 Located just south of the Longstreet Observation tower in Gettysburg National Military Park. Marker is in this post office area: Gettysburg PA 17325, United States of America. Touch for directions. Other nearby markers. At least 8 other markers are within walking distance of this marker. Kershaw's Brigade (within shouting distance of this marker); South Carolina (within shouting distance of this marker); Semmes's Brigade (within shouting distance of this marker); Georgia (within shouting distance of this marker); Carlton's Battery - Cabell's Battalion (about 300 feet away, measured in a direct line); a different marker also named Carlton's Battery - Cabell's Battalion (about 300 feet away); McLaws's Division (about 400 feet away); Cabell's Battalion (about 400 feet away). Touch for a list and map of all markers in Gettysburg. The examples on display at Manley's Battery were produced by the C.S. Arsenal, Columbus Georgia. 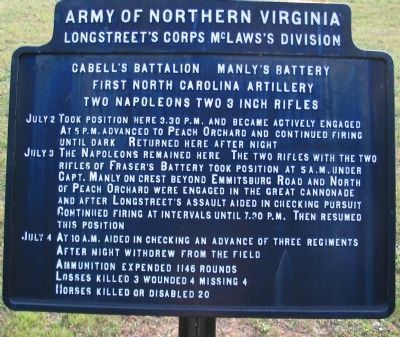 As stated on the tablet, the Napoleons of Manley's Battery began the actions on July 2 at this location and spent much of July 3 at this point also. From this location, the guns could range the Federal positions in Plum Run Valley. More. Search the internet for Manly's Battery - Cabell's Battalion. Credits. This page was last revised on June 16, 2016. This page originally submitted on October 10, 2008, by Craig Swain of Leesburg, Virginia. This page has been viewed 928 times since then and 9 times this year. Photos: 1, 2, 3. submitted on October 10, 2008, by Craig Swain of Leesburg, Virginia.